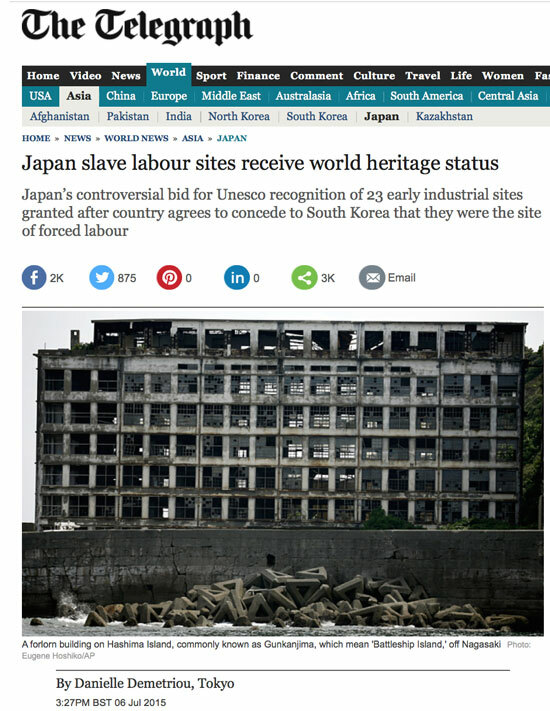 A string of Japanese mines, shipyards and steelworks has been granted Unesco world heritage status after the country acknowledged they were once the setting for slave labour. Japan's efforts to gain recognition for the 23 sites, seen as representative of the country's industrial revolution, had attracted widespread criticism from South Korea and China. Both countries claimed the bid overlooked the suffering of large numbers of their citizens who were shipped to work at the facilities by Japanese occupiers before and during the Second World War. Families of British prisoners of war forced to work at some of the sites also spoke out against the bid. But South Korea dropped its opposition after Japan agreed to make it clear in any Unesco registration that some sites used forced labourers from the Korean peninsula. That paved the way for Sunday's decision, which was celebrated in Japan yesterday. A Japanese representative at the Unesco meeting in Bonn, Germany, said that the nation was “prepared to take measures that allow an understanding that there were a large number of Koreans and others who were brought against their will and forced to work under harsh conditions in the 1940s at some of the sites”. In a further concession to its neighbour’s demands, Japan will also set up an information centre to honour the victims, according to a statement on South Korea’s foreign ministry website. It added: “For the first time, Japan mentioned the historical fact that Koreans were drafted against their will and forced into labour under harsh conditions in the 1940s." No specific reference to British prisoners of war was made. Shinzo Abe, the prime minister, welcomed the decision to include the sites on the list in a carefully worded written statement which avoided all mention of the South Korean concessions. The 23 celebrated industrial sites, which span eight prefectures in Japan, include a steelworks, a shipbuilding yard and a coal mine built around the reign of Emperor Meiji (1868-1912). As well as Nagasaki’s Hashima Island, the list includes the setting for the villain’s lair in the James Bond film Skyfall.